In our previous blog, we discussed the top 15 business aspects to consider before choosing an ideal Salesforce data archiving approach or solution. If you haven’t read that yet, you can read it here. 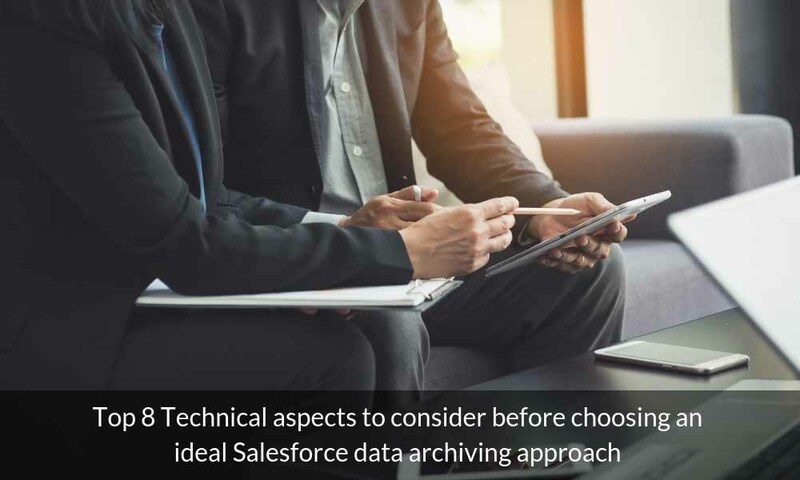 In this blog, we are going to discuss what could be the technical aspects to consider before choosing an efficient Salesforce data archiving solution for your enterprise. Below are the top 8 factors to consider. When you are dealing with a lot of business data, especially sensitive business data, you have to consider various aspects of data relationships while thinking about any data archiving solution. So, it is always recommended to go for a structured data archiving solution which can move your data from your primary storage to an alternate storage space. A structured data archiving solution like DataArchiva takes care of your complex data relationships while maintaining data accessibility and referential integrity. Your Salesforce data archiving solution must be compatible with both Lightning & Classic so that you can view your archived data using your standard UI layout. For example, if your archiving solution doesn’t support Lightning experience, it will hinder the user experience. Automation is the most crucial feature of any technological solution. This saves a lot of time as well as human effort. While choosing an ideal data archiving approach, it is important to consider the automation capabilities. The application should be able to automatically archive your Salesforce data without interrupting your business. DataArchiva offers auto archiving option by it’s scheduled archiving feature. Once scheduled, DataArchiva will help you run your data archiving job periodically with the help of query filters. An ideal data archiving solution must support both internal and external files and attachments. So, it is important to consider this aspect before choosing any solution. There are various data types in Salesforce like Chatter, Feeds, Emails, Files etc. Your data archiving solution must support all these data types in order to offer you an uninterrupted experience. It is very crucial for a data archiving solution to have inbuilt capabilities in order to work in tandem with any other third party solution. You may require any third-party solution to automate certain business processes or even to boost operational excellence. Your data archiving solution should work seamlessly with other third-party AppExchange application or cloud/SaaS based solutions. Before choosing a Salesforce data archiving solution for your Salesforce Org, make sure it offers a seamless integration facility. If your business is dealing with a huge volume of data and needs to archive them to an alternative storage space so that you can free up your primary storage, you must check the platform limitations of the data archiving solution. This may include factors like memory, file size, API support etc. An ideal platform usually has lesser limitations and it doesn’t restrict it users. Your data archiving solution must be able to restore the archived data on demand without much hassle. However, it is essential to restore the archived data while keeping the data relationship intact. These are few of the important technical aspects which an enterprise should consider before going for a Salesforce data archiving solution. Native solutions like DataArchiva can meet all these needs with its technological superiority. If you want to learn more about how can you archive your Salesforce data at the native level while potentially reducing 80%+ data storage cost, reach out to our expert today.